I love to look at reportage drawing. It seems to show things in a way photography can’t. 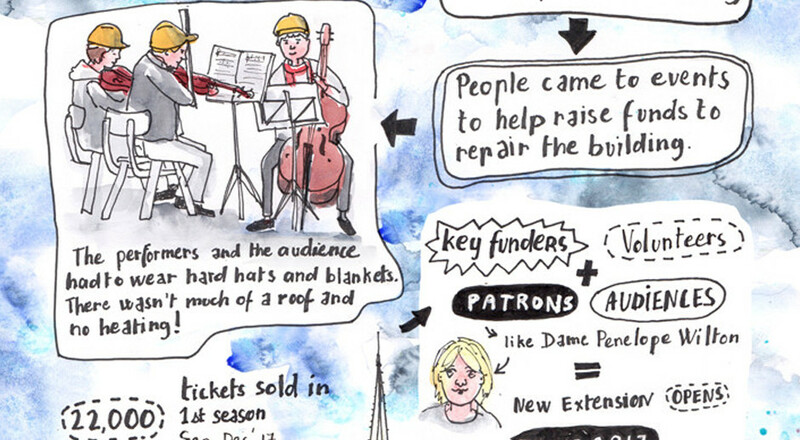 So I was delighted to try my hand at some reportage drawing of my own. 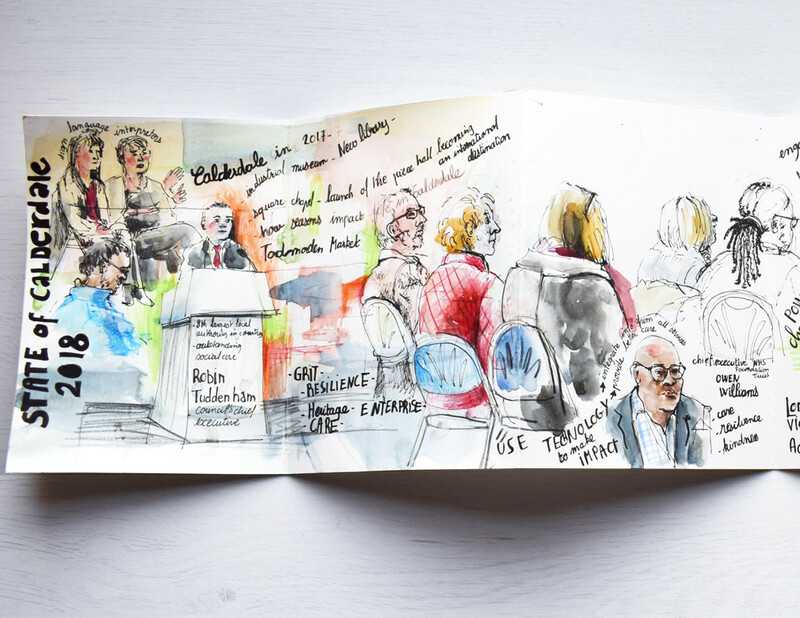 I was invited to sketch at the ‘State of Calderdale 2018’ – a local authority conference. 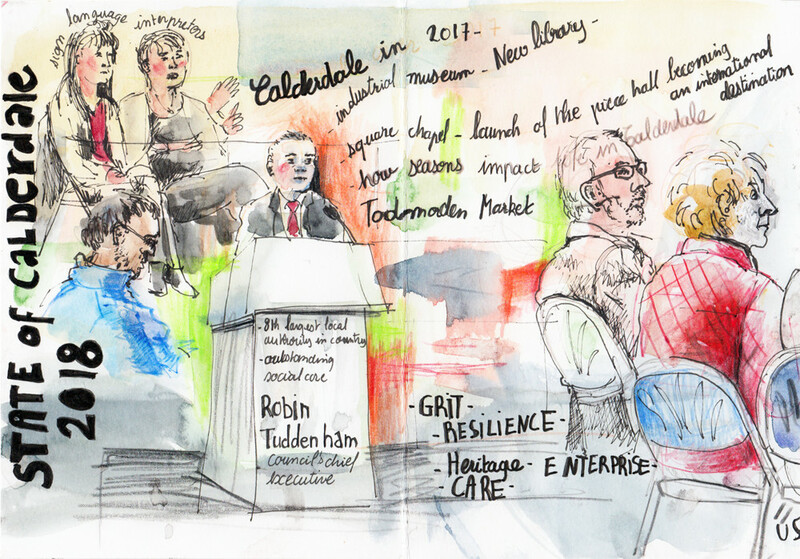 The conference was about how to make Calderdale a better place to live and work. Peeping into the inner workings of a council was fascinating. The first half of my sketch of the ‘State of Calderdale’. The second half of the small concertina sketchbook. I decided to sketch the whole even on one home-make concertina sketchbook. For this, I used a large 30 inches sheet of 300mg watercolour cut into thirds along the length. I then folded the paper into six sections to make my own mini accordion style sketchbooks. 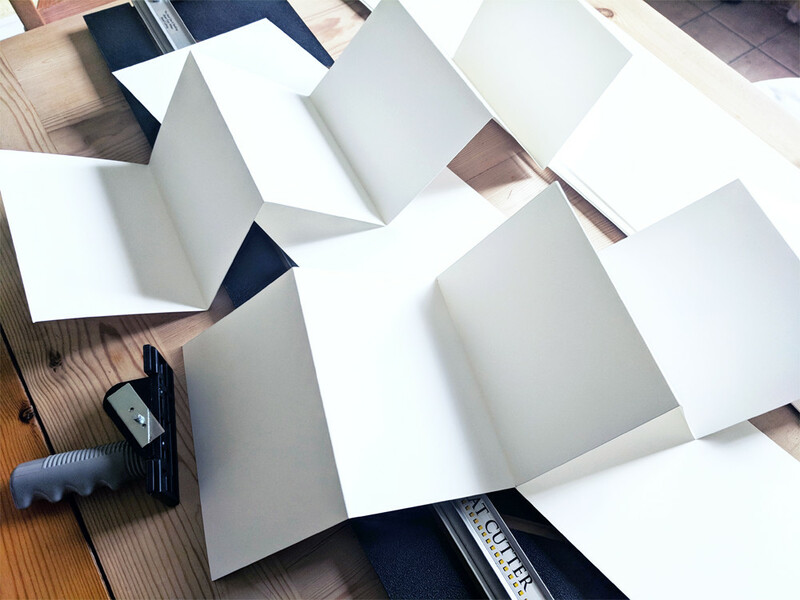 Cutting and folding watercolour paper to make mini concertina sketchbooks. I found the format perfect for reportage drawing because the narrative can stretch across the length of the book. I composed the page as I went along, drawing as the events unfolded. Maybe I could have studied the event schedule and planned the composition a little beforehand. I had to draw a couple of the last speakers on the back and add them to the drawing with photoshop later. A photo of the completed sketchbook. 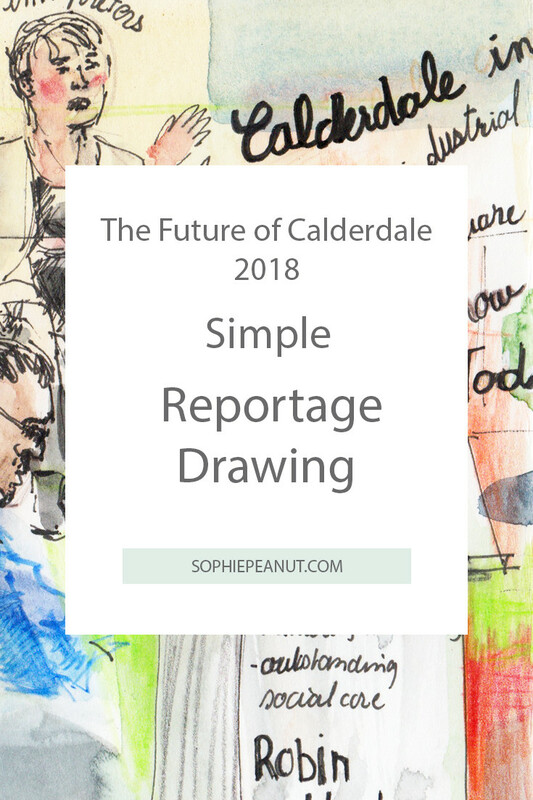 State of Calderdale 2018 – the whole sheet of sketches scanned and edited to fit in the speakers I drew on the back of the paper. 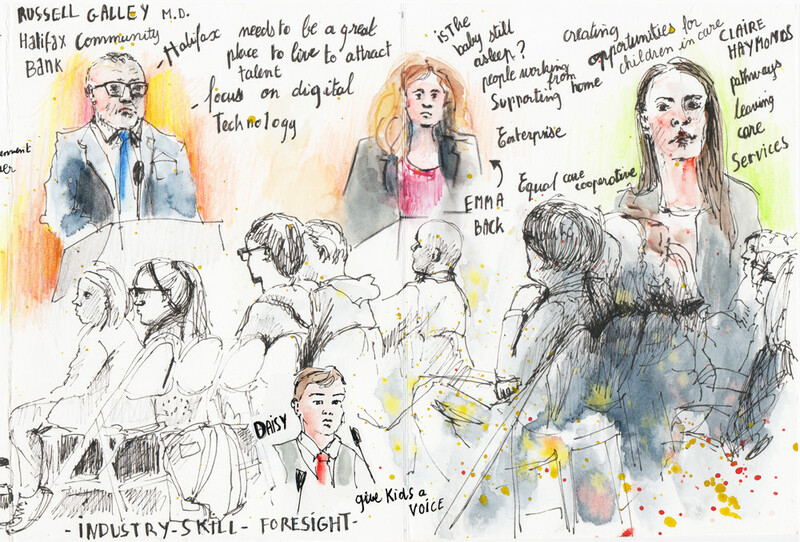 In addition to drawing the featured speakers and snippets of the talks, I tried to show what it felt like to be there. So I spent some time sketching the audience too. There were people in suits and some dressed casually – a few teenagers and also two sign language translators. I wanted to sketch the energy of the event too. There was a huge backdrop with photos behind the speakers, which I abstracted with colour patches. 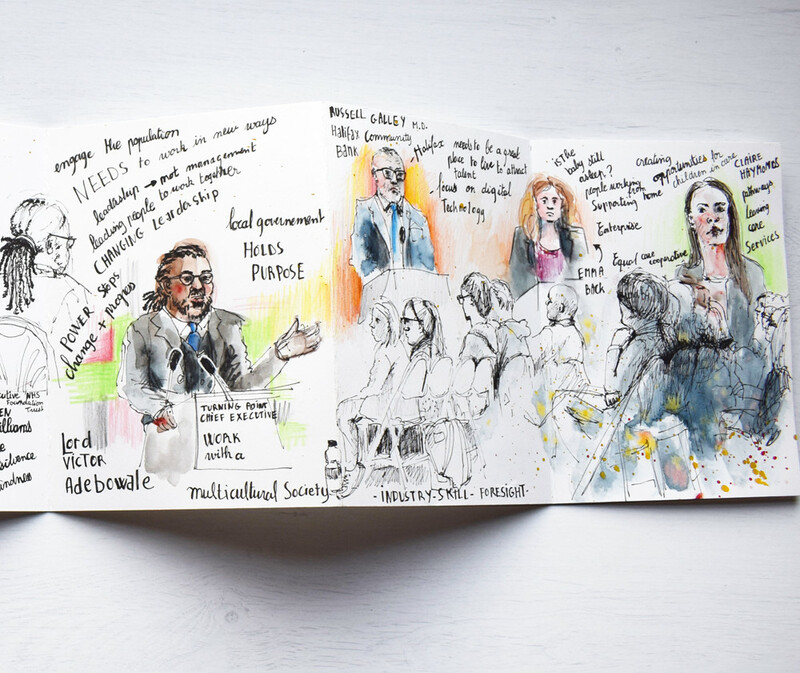 The conference was interesting and I really enjoyed drawing a live event. I liked the pressure to draw quickly. There was no time to think – just focussed drawing. Bliss! Start of the conference. There was a huge backdrop with photos. I represented it with patches of colours. You can see the two sign language translators in the top left corner. 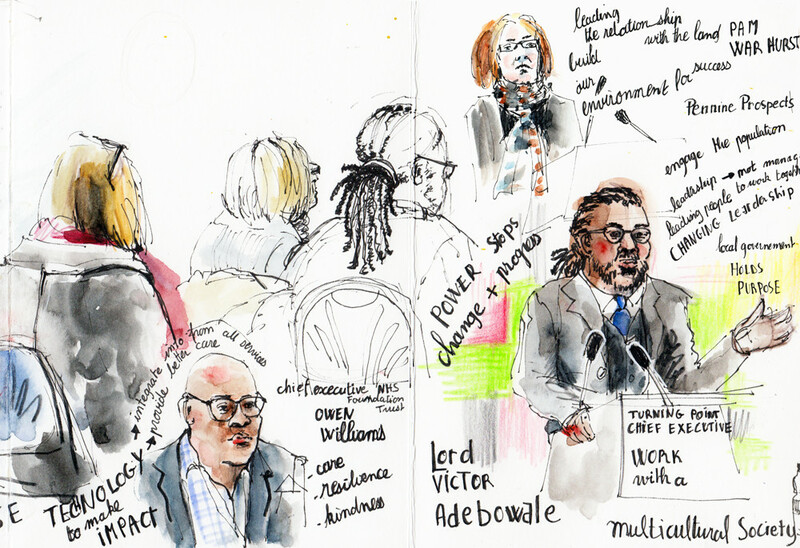 Drawing some of the speakers while they are waiting and went on stage. Finally, drawing a series of speakers and some of the audience too. Sophie Peanut is a sketch artist and illustrator based in Halifax UK. She works in pen and watercolour. Sophie loves urban sketching, drawing people and landscapes and likes to illustrate recipes. She also teaches drawing and painting online.